I don’t know about you, but when I’m at a party I always gravitate towards towards the portion of the table where the dips are located. With most dips made up of cream cheese, sour cream and/or mayonnaise and then topped with at least a cup of shredded cheese, it’s not hard to overindulge. And then I find myself shoving veggies in my mouth in attempts to counteract the hundreds of calories in dairy I just consumed. I decided to try my hand at lightening up this dish, just in time for #RecipeMakeover. In case you missed my post from yesterday, #RecipeMakeover is a event with 40+ bloggers who have taken those less healthier choices and found healthier alternatives. Read more about it here, and don’t forget to enter the giveaway! 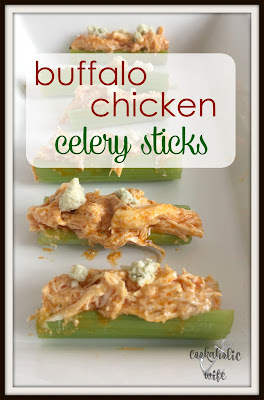 The classic buffalo chicken recipe is made dairy-free and lightened up by being served on celery sticks instead of a sandwich. 1. Remove the skin from the rotisserie chicken and shred into pieces. (For an even lighter dish, only use the breast meat and save the dark meat for another use.) Set aside. 2. Combine the hot sauce, butter, garlic and vinegar together in a large saucepan over high heat until boiling, whisking constantly. 3. Remove from the heat and stir in the cream cheese style spread until melted then stir in the shredded chicken. Stir until coated. 4. Rinse celery and cut off ends. Remove leaves from tops and slice into 3-4 inch stalks. 5. 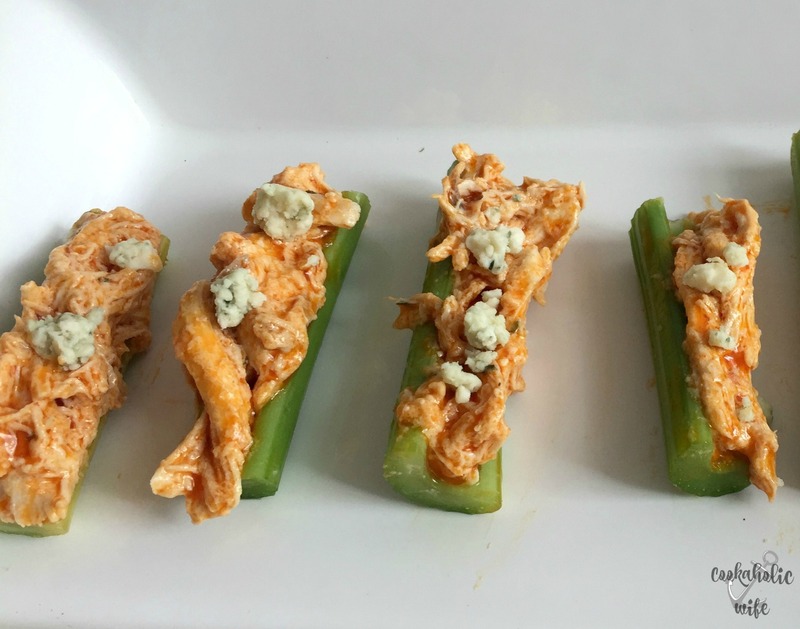 Spread buffalo chicken mixture down the center of each piece of celery. 6. Serve as is, or optionally, drizzle with dressing or top with chopped chives. 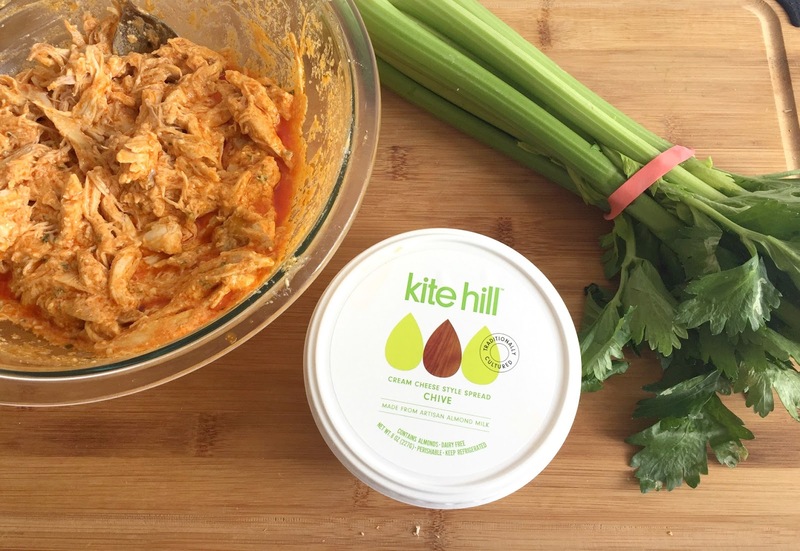 Buffalo chicken mixture can be served over other vegetables or on slider rolls. Mixture can be refrigerated for up to 4 days. Reheat in individual servings to avoid the mixture drying out. Now, this does have a bit more butter than I was hoping to use in a healthier recipe, but I found using less made the mixture too dry so instead of cutting back on the butter I opted to switch out the cream cheese for a non-dairy version made with almonds. If you’re unable to find this, a reduced fat cream cheese would work just as well. You really can’t tell that this is a lighter version of the classic dip. I love the bit of tang that comes from the chives in the cream cheese style spread. gonna admit this here but don't hold it against me, as a child I would eat so much french onion dip EVERY YEAR at Christmas Eve I'd get sick… good thing I grew out of that phase, oh wait.. This is awesome! 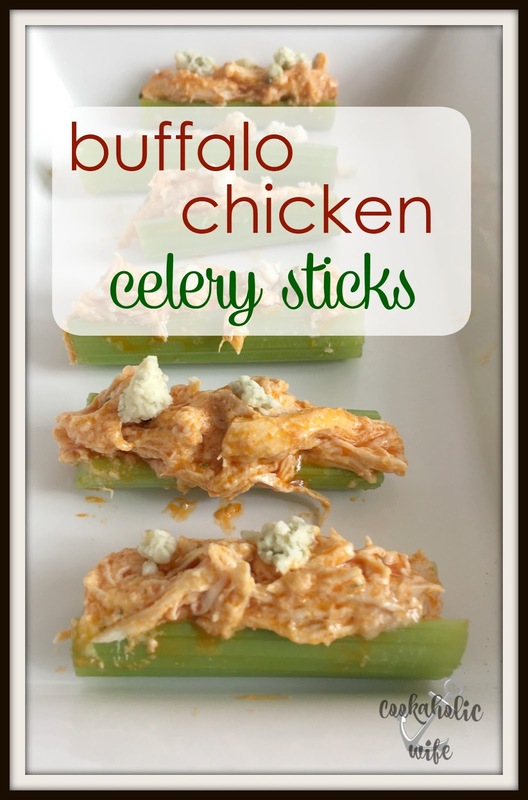 What a fun and healthy spin on the classic buffalo wings! Yay!